Made glorious summer . 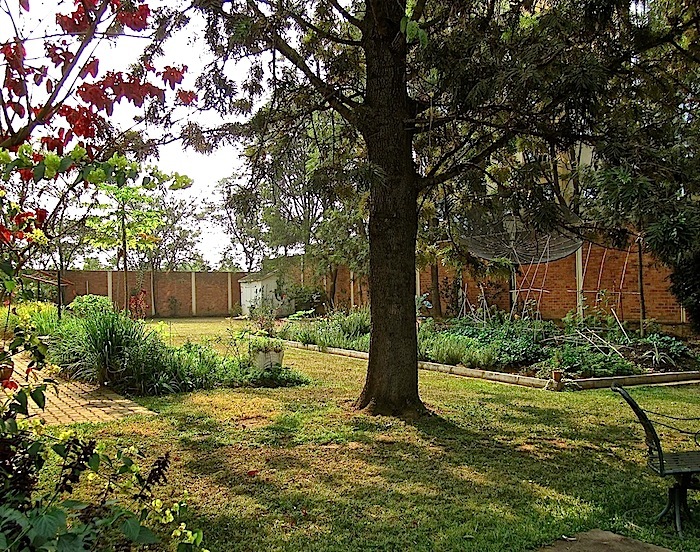 . .
We are just below the equator here in Rwanda, so technically it is near the end of winter — and of the long dry season, which began in May and normally ends in September. But last night there was a light rain for about seven hours, so today I don’t need to water anything in the garden, not even the new plants. The cutting garden (left) and the vegetable garden (right). We’ve really cut back on watering this year, anyway — none for the grass and a lot less for the planting beds. The grass is going brown, but we still have a lot of flowers, particularly my stalwarts, yellow daylilies and pink gerbera daisies. 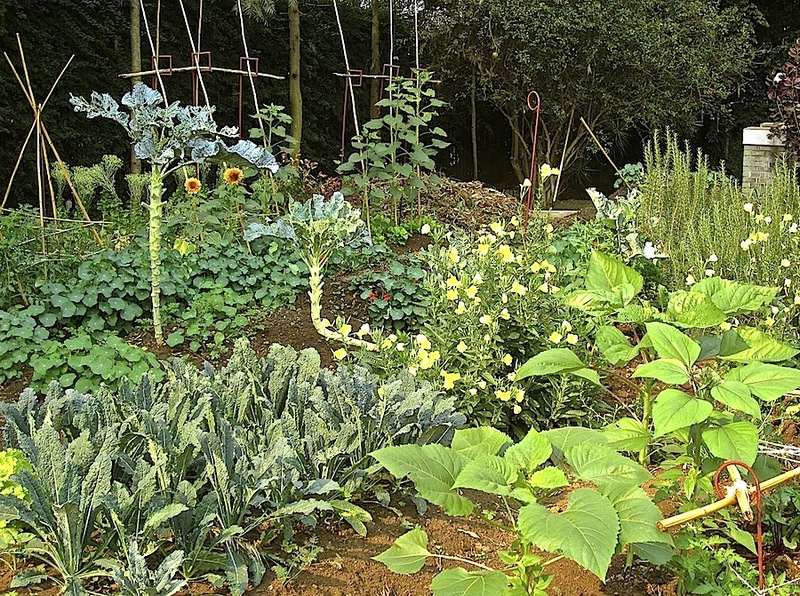 The vegetable garden with kale, sunflowers, Missouri primroses, nasturtiums. My biggest project in the last month has been to tackle our mess of a vegetable garden, which has consisted of several not very productive, but very wide and long raised beds. Their dimensions just weren’t manageable, so we’ve dug new paths and now all the beds are about 4′ x 5′. 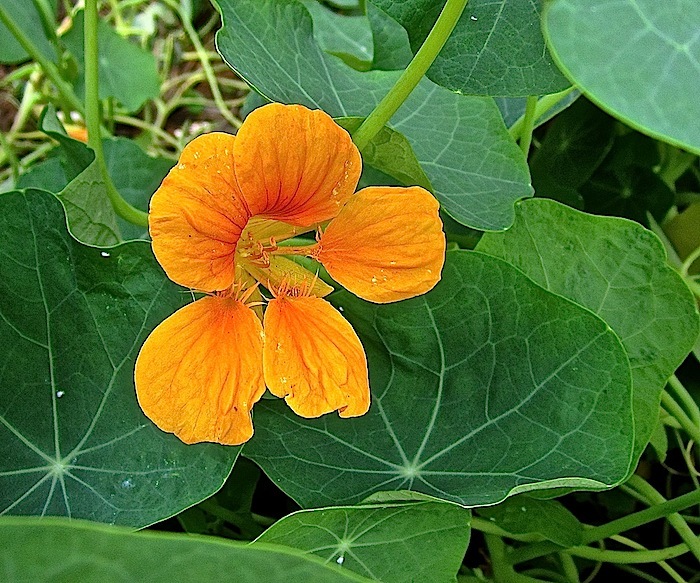 Orange nasturtium bloom in our vegetable garden. 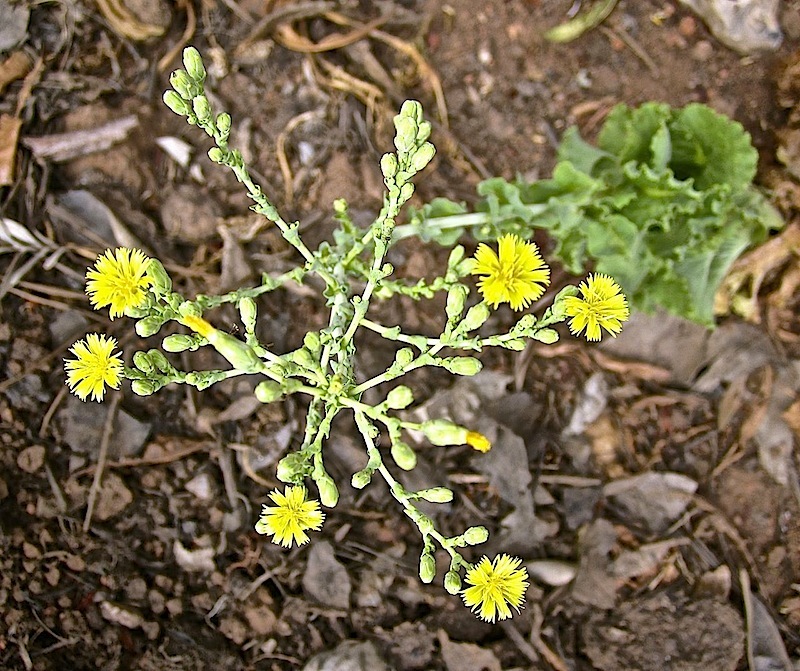 Growing among the argula, lettuce, kale, strawberry, and tomato plants are also celosias, nasturtiums, Missouri primroses, and sunflowers. 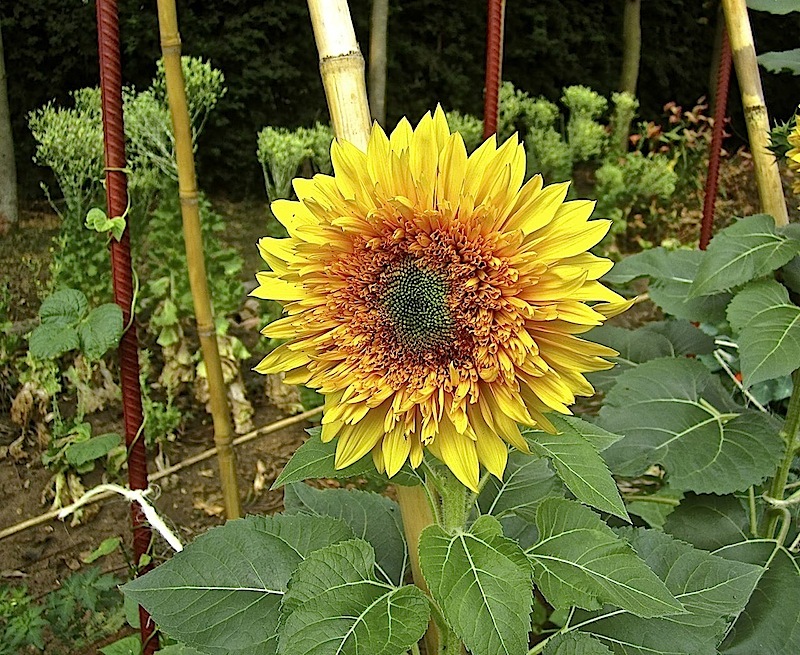 Sunflower (one of the shorter varieties) in our vegetable garden. 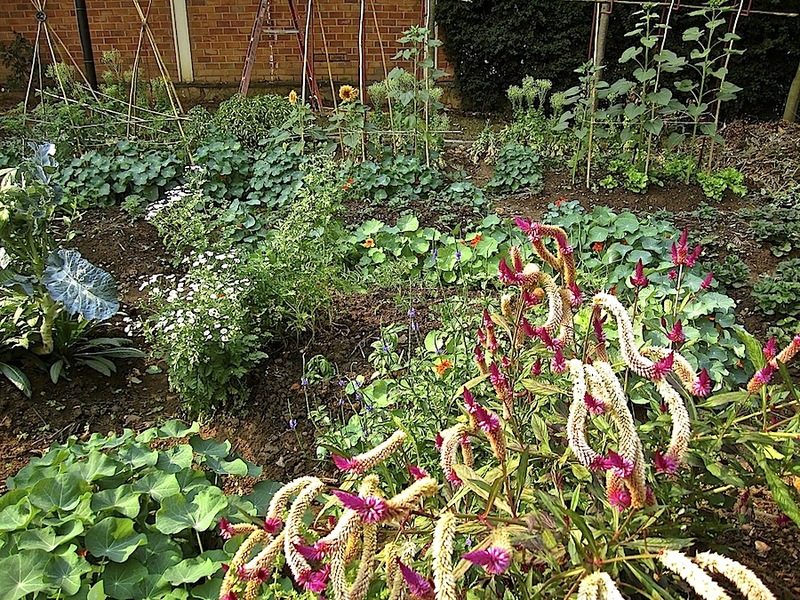 Our still rather disorderly garden with celosia, feverfew, supports for tomatoes, with a row of lettuce going to seed along the back. Recently, I tried to grow American hardy hibiscus from seed (in the vegetable garden, where the soil is best), and, despite the fact that I have always read that this is a very easy thing to do, only about ten seedlings appeared from two packets of seeds, and for weeks they have remained at 2″ tall. Nothing at all came up from a packet of black-eyed Susan seeds; only one plant from a packet of Verbena bonariensis. However, alpine strawberry seeds have produced about 15 plants. I have also done well with re-seeding lettuce, dill, basil, garlic chives, and coriander and with rooted rosemary cuttings. I have high hopes for my cherry tomato plants, many of which have clusters of tiny fruit. 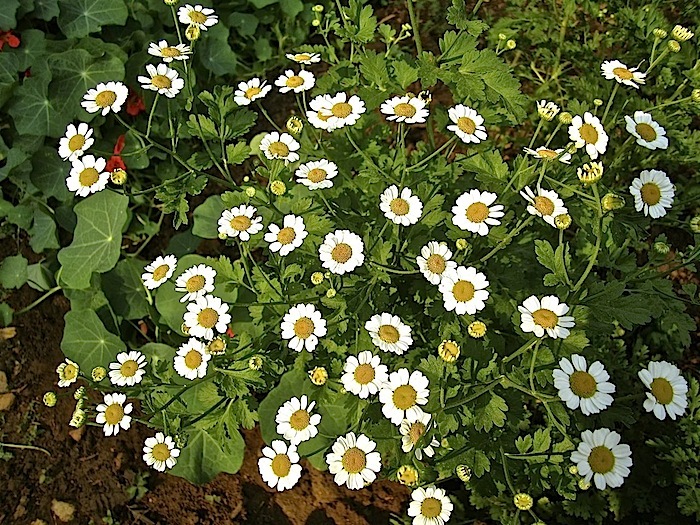 Feverfew in the vegetable garden. 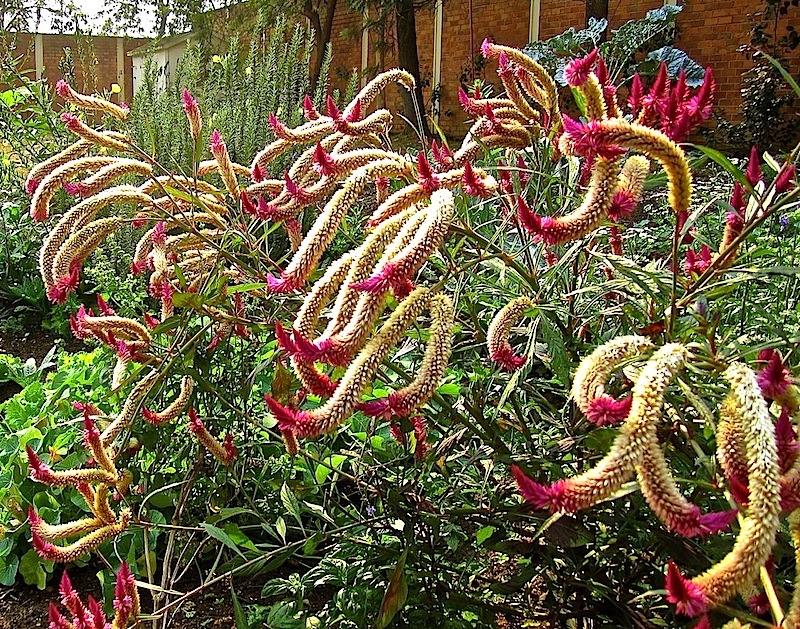 Celosia in the vegetable garden. The fading blooms are full of seeds. 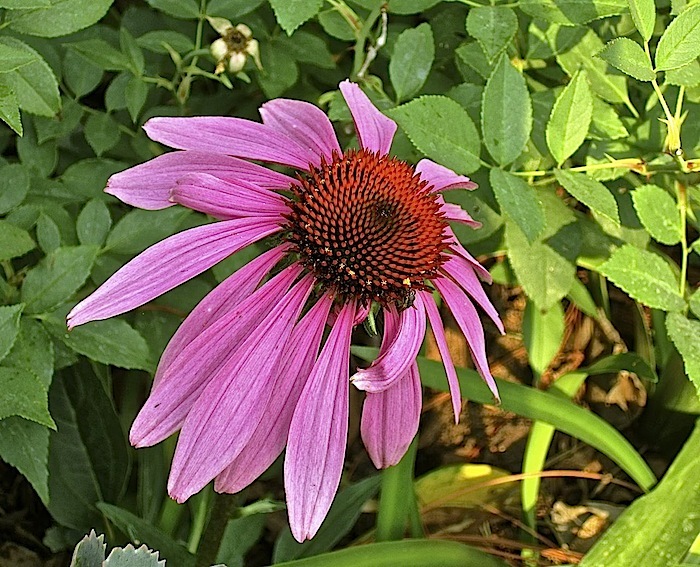 In the long flower border along the lower lawn, I have one bloom from several purple coneflower plants that I have grown from seed. The first coneflower bloom from plants I grew from seed. Garden Bloggers’ Bloom Day is the 15th day of every month. Check out May Dreams Gardens to see what’s blooming in other garden bloggers’ gardens today.